Nursery Program : Divided into three semesters. School open enroll all year. 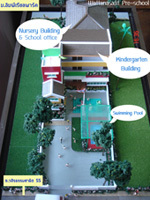 Pre-Kindergarten Program : Divided into three semesters. School open enroll all year. Kindergarten Program : Divided into two semesters. Nursery : 9:00 a.m. - 2:00 p.m.
Pre Kindergarten : 9:00 a.m. - 2:00 p.m.
Kindergarten 1-3 : 9:00 a.m. - 2:45 p.m.
Monday - Friday : 8.30 a.m. - 5 p.m.
Saturday : 9.00 a.m. - 2 p.m.
A one-time application fee is charged to each student. This must be paid before the application process begins and is nonrefundable. WST students wear three uniforms , a regular school uniform , Thai dancing uniform, PE uniform. Students are required to wear uniform at all times. School buses are available for students. Fees are assessed according to distance. All fees will not be pro-rated for late enrollment.